It shows how clueless I am, and how much the My Blind Date with a Book feature will help me, when I don't even know that Robert Louis Stevenson is actually the author of Treasure Island! 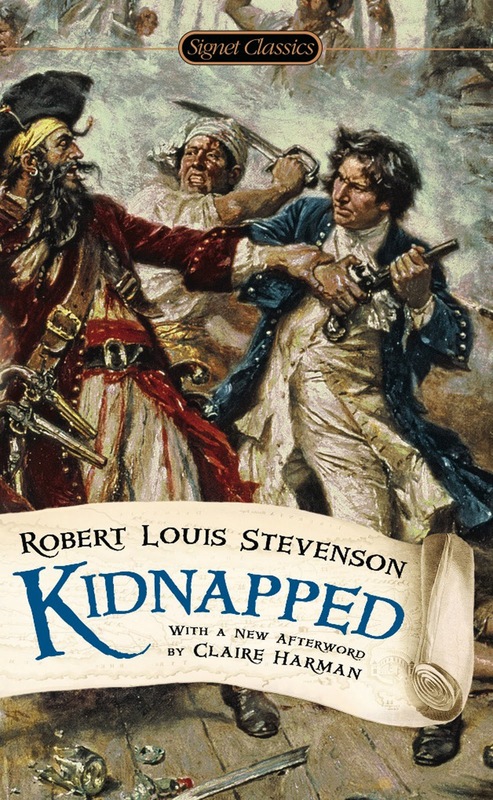 Of course, I know the book (haven't read it) and have seen the movie, but I didn't know who had written it, so that when I picked up Kidnapped by Robert Stevenson, I had no idea who the author was. So, you see, this new feature is already working at exapanding my knowledge! Kidnapped follows the adventures of young David Balfour across the Highlands of Scotland. It involves some historical facts and figures, including a controversial murder case; by chance "Davie" finds himself caught up in the mystery. Starting off, I didn't enjoy the novel; but eventually, it caught my interest and I found the reading light and easy. The novel was in the first person with David himself telling us his story. As a young boy of 17, he unexpectedly finds himself the heir to an estate. Unfortunately, his greedy uncle manages to get rid of him and from here begin David's adventures. Tossed in the high seas, shipwrecked and later running for his life across the Highlands with his new friend Alan Breck, David Balfour experiences more life in one year than he did in all his other seventeen. What made the story for me was the friendship between Alan Breck and David Balfour. It was portrayed so naturally, with all its ups and downs and actually caused me to laugh quite a bit. The youth and emotions of David Balfour as he continues his journey were drawn realistically; he seemed like the 17 year old boy that he was, coping with the situation he found himself in. Set in the Highlands, the whole atmosphere of the book has a mystical quality to it, with stories of fairies and superstitions a natural part of it; the people in the Highlands have a feel for their land - almost as if they were one with it. I love stories about the Highlands, and the bravery and loyalty shown by its people is often read about. I enjoyed the book, and might even pick up a second adventure novel by Robert Stevenson. On the whole, I would rate this (see HERE for my ratings) number 3: First date was OK. Second may or may not happen. Having rated it, I still have to say that I'm not sure if the Adventure Novel is a genre I like. To find out, I'll have to read other books by different authors. Recommendations anyone? ?